A solar plane tipped to one day soar to the edge of space has successfully completed its maiden flight, showing off its impressive wingspan during a test run in Switzerland. With wings measuring 24.9 meters (82ft), the SolarStratos aircraft aims to observe the curvature of the earth and fly at an altitude of around 23,000 meters. 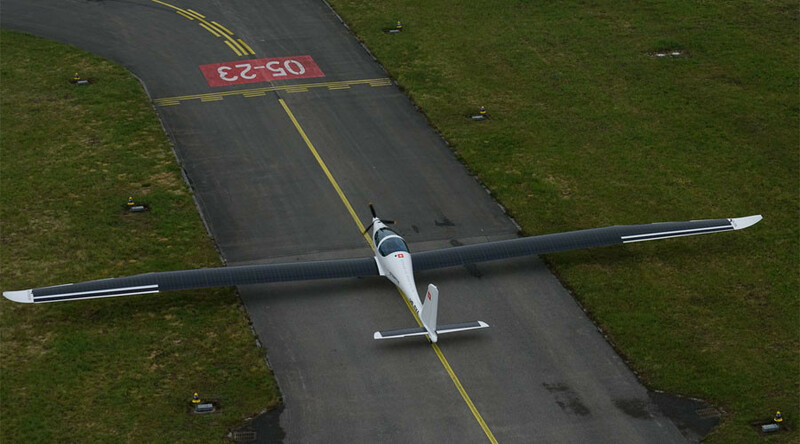 The brainchild of pilot Raphael Domjan, the solar powered plane took off from an airfield in Payerne, Switzerland, on Friday morning. Flown by test pilot Damian Hischier, the aircraft reached a height of around 304 meters in what was its first ever flight, AFP reports. A statement by the plane’s designers described the anxiety before take-off and the utter joy of realizing that “SolarStratos flies”. “The plane rolled faster and faster, while our heartbeats accelerated to a crisis. And there, all of a sudden, the wheels left the track. Ultimate adrenaline rush, followed by a moment of incredulity and the explosion of joy,” the statement reads. In the future, the eco-adventure company hope to be able to open up stratospheric flights to the public, which will require passengers to don an astronaut’s suit and helmet due to the fact that the lightweight aircraft is not pressurized. Swiss entrepreneur Bertrand Piccard, who is also pursuing clean energy aviation with the Solar Impulse solar plane, paid tribute to SolarStratos online. Piccard’s Solar Impulse 2 aircraft touched down in Dubai last year to complete a round-the-world trip without using a single drop of fuel.